I ate one of the best Italian meals of my life (at that point) at a restaurant in Amsterdam called Italia Oggi. We moseyed on over after the restaurant we were trying to go to was booked, what luck! 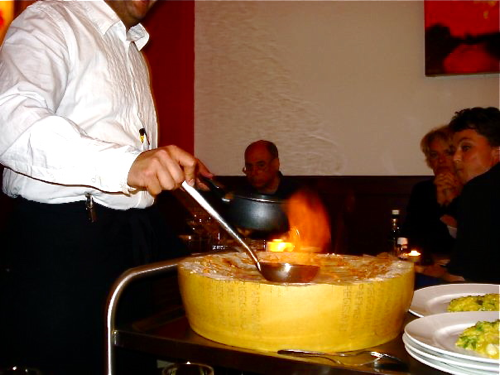 I ordered parmesan pasta, and the next thing I knew, the waiter wheeled over a cart with an enormous wheel of parmesan cheese on it. He dumped my noodles onto the cheese, ignited them, and began mixing them around. Then, he started scraping up the cheese and mixing it into my pasta. Not only did I get a fabulous and surprising show, but I also got a meal to remember. I think about that pasta frequently, hoping and hoping that the restaurant will still be there whenever I return to Amsterdam. Then, I go online and watch this video to relive my awe. Skip to the 35 second mark to see the wheel of cheese in action. What a great day.